It has never been so easy to research and book a hotel, either last minute or while comfortably planning your trip. Virtually all of the big hotel review and booking website each have their own app, but we’ve also thrown in a few recent start-ups and alternatives to keep it fresh! Many hotel review apps are linked to nearby restaurant and places of interest reviews as well, leaving you more time to relax and enjoy your trip. If you enjoying researching and booking hotels on TripAdvisor, Booking.com, or Expedia, then you’ll be happy to know they each have an app! All three apps allow you to search hotels based on your current location, or worldwide, and you can sort them by popularity, rating, and price. There are slight variations between each app, such as mapping options, and links to nearby restaurants. Stuck overnight in an unexpected location? Have no fear, there are several apps designed to search for last-minute specials for same-day hotel stays. 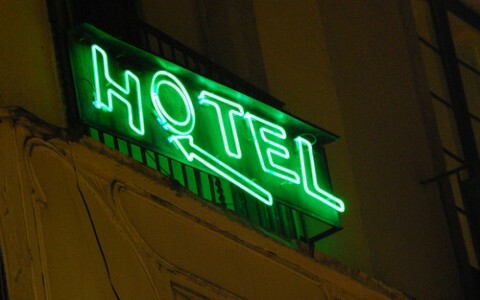 The recently-released Hotel Tonight app (Android, iPhone, iPad) can find you hotel deals in cities all over North America, while Booking.com Tonight (iPhone, iPad, and iPod only) app let’s you search for hotel rooms worldwide, and sort them by price, discount, or popularity, and includes Booking.com’s reviews. Backpackers can also enjoy the benefits of traveling with a smartphone with Hostelworld’s app (iPhone and Android). If you’re looking for a Hostelling International certified hostel, they have an app (iPhone only). Staying at the homes of locals is a great way to meet people and learn about a place. Whether you want to couchsurf for free, or pay for the extra convenience, all the main websites now have apps to help you plan your stay. The not-for-profit Couchsurfing.org has recently launched a new app (iPhone only, Android coming soon) bringing “a better, friendlier world where people who are different from one another can find their similarities” into the convenience of mobile technology. The two most popular holiday rental sites, Airbnb (Android and iPhone) and HomeAway (Android, iPhone, and iPad) also have useful apps that will let you search for accommodation, contact hosts, and book a room or home. If you’re looking for more of an adventure, try searching for “hotel” in your map application and see what’s nearby or in a neighbourhood you enjoy. You may discover a hidden gem that’s off the radar of the major travel sites. If it’s late at night though, please be careful! If you would like to reduce the ecological footprint of your stay, you should consider looking for a hotel that certified under one of the various “green” certification programs. The more popular ones include Green Globe, Green Leaf, and Green Key. Green Globe (iPhone only) has an app that enables you to look up Green Globe certified hotels and venues in over 70 countries all over the world.